Two trends in the backup industry have created an acute need for smart file systems: the rising demands for more sophisticated uses of backup data—think big data analytics—and for harnessing the computing power of cloud through online backup. Unfortunately, traditional file systems were not designed with backup applications in mind. 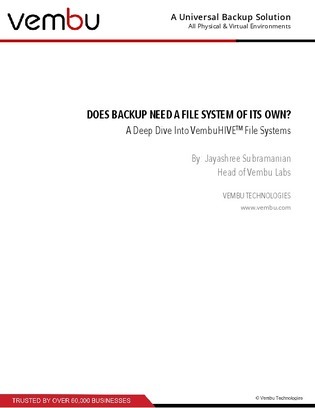 This paper offers a solution to this conundrum with VembuHIVE, a cloud file system designed for large-scale backup and disaster recovery applications. Continue reading for the use cases, including mail/document/file-level restores, and further features and benefits.